Welcome back to everyone who took last week off. You missed the worst million-dollar race I have ever seen (the Pennsylvania Derby), and one of the best races with a four-horse field that I can remember (Questing vs. My Miss Aurelia in the Cotillion). The stakes schedule is exploding with 10 Grade 1 races at Santa Anita and Belmont, all on Saturday. Whether you plan to bet or not, it's best to follow along. We are entering primetime intelligence gathering for the 2012 Breeders' Cup (Nov. 2-3 at Santa Anita), and that's generally how I approach these next two weekends of preps. I'll jump into the pools if I see an overlay, but the big money lies in properly interpretting these races on Breeders' Cup day. Keep in mind the form we saw at Del Mar could easily get turned upside down with the SoCal circuit back on dirt. 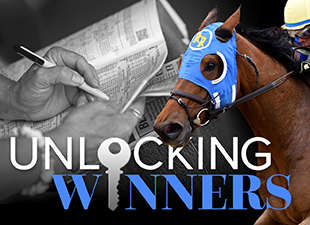 Regular Locksmith commenter Keelerman suggested we have a little bragging rights handicapping contest this week, and I agreed. Select one horse in each of the 10 Grade 1 races. Winnings will be determined by $2 win/place wagers. Beldame: I would love to see Royal Delta get going in the right direction again. I thought she looked washed out and just had an off day in the Personal Ensign. She's the best filly or mare in America when on her game. Vosburgh: I'll take a price shot with Rothko. Flower Bowl: Dream Peace (Ire) ran a nice second behind the now retired Winter Memories, and trainer Chad Brown wins 33% with horses making their first start for him. Turf Classic: Point of Entry is a legitimate American hope to regain the BC Turf crown. Jockey Club Gold Cup: I have felt for some time that Ron the Greek is going to win the Breeders' Cup Classic. He finally gets back to 10f, albeit at an odd track configuration (1.5 turns) in a small, relatively paceless field. Doubt I'll be betting this race, and I just want to see The Greek finishing strongly, much like Drosselmeyer last year. Chandelier: Executiveprivilege is a beast and the most likely winner of the BC Juvenile Fillies. She has a bulldozer of a presence and I can't wait to see her on dirt. Front Runner: Know More has a sharp mind and a classy presence. I think he can improve going two turns. He's the best 2yo colt in Cali from what I have seen and maybe the best in the country. Zenyatta: This race looks like it will set up for a closer, and I think 4-year-old Star Billing looks interesting making her first start on dirt. Her dam is a half sister to two Grade 1 winners on dirt -- Stellar Jayne and Starrer. And note that Starrer was by Star Billing's sire Dynaformer. Gap in the workout pattern after the good 2nd in the Clement Hirsch noted, but if she runs well here and comes back in the Breeders' Cup Ladies' Classic, she could be a live longshot. Rodeo Drive: I was all set to pick three-year-old Lady of Shamrock in here vs. older, but she may instead pop up in the QEII Stakes at Keeneland or train up to the Breeders' Cup. In her absence I think the classy Marketing Mix is a standount. Awesome Again: Game on Dude is formidable, and the rider switch to Bejarnao is a plus, however he drew the rail and has a lot of speed outside of him. For contest purposes, I'll take Richard's Kid, who carries 5 pounds less than the Dude.